Product: Mashers Optipack 1000ml Rectangular Disposable Plastic Food Containers with Lids, Pack of 5 was added to cart. These Large Rectangular Disposable Plastic Food Containers with Lids by Mashers remain a popular choice with catering professionals and take-away venues thanks to their lightweight design and quality construction. Made from clear food-grade plastics, they feature self-sealing hinged lids, ribbed detailing, and they have a substantial capacity of 1000ml. 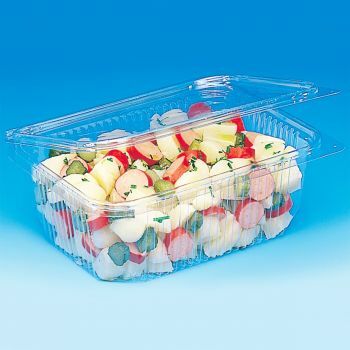 Perfect for storing and transporting salads, desserts, pasta dishes, fruit dishes, and snacks, these take-away containers are fully stackable, fully disposable, and they offer excellent product visibility.